I began healing more than 20yrs ago because I could feel balls of heat in my hands. My career then was in the theatre and singing was part of that, so I found myself becoming more and more interested in how sound works on the body and after a few years of exploring different sound healers work , I trained with Simon Heather. 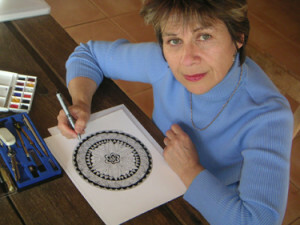 In 2005 the mandalas landed I had no previous art background and believed I couldn’t draw and yet had a strong compulsion to draw what I was seeing. I truly believe it was working intensely with sound that moved my energy enough to send in the mandalas. The mandalas have such strong messages that I now have a set of affirmation reading cards which I use to give life guidance readings. I use my voice and the sacred Sanskrit sounds for balancing the chakras this is a deeply relaxing session. In this session I will be working intuitively, channelling healing through my hands and combining this with sound. I may also use visualisation/affirmations and my mandalas, depending on what is being worked on. This is a one to one session for anyone who would like to know how it feels to use their own voice for self – healing. Or, just to explore sounds. I hr sessions or 90 mins. Guidance readings for your own personal journey of self empowerment reflected through my affirmation mandala deck. The mandalas can hi-light repeating patterns, what you are working with in this life time and your gifts and talents. The reading can also indicate future potential and what you can achieve. The reading gives guidance on what action is needed to create change.